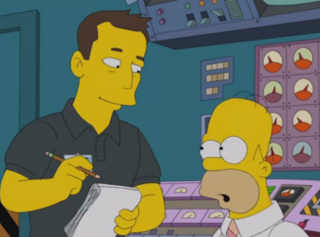 Elon Musk (left) guest stars in the Jan. 25, 2015 episode of "The Simpsons" on Fox. This season of "The Simpsons" has been particularly spacey. In Sunday's (Jan. 25) episode of the long-running Fox cartoon TV show, SpaceX founder Elon Musk is "quietly" traveling the United States in his crewed Dragon spacecraft searching for something to inspire him. The billionaire inventor even shows off his "Springfield Hyperloop" featuring a small mouse that throws up after a ride on the machine designed to get people from point A to point B at high speeds on the ground. Musk has been in the news a lot recently thanks to his new plans for his electric car company Tesla and SpaceX's contract to fly NASA astronauts to the International Space Station by 2017. And of course, at one point, Mr. Burns mistakes Musk for Henry Ford after being told that Musk "revolutionized the car industry." Two weeks ago, the Simpsons family was captured by a group of aliens that transported them to a far off planet, presumably far away from the solar system. The space travel plotline also gave the TV show's writers a chance to dust off one of the most fun Simpsons-in-space gags ever. In a season 5 episode of the show, Homer travels to space aboard a NASA space shuttle and eats floating chips in microgravity. The new alien abduction episode called "The Man Who Came to be Dinner" features Homer trying to recreate that magical snack moment, but Bart keeps ruining his floating chip fun. Watch both full episodes for free on Hulu now.